This being the last day of February, also makes it the last day of “heart health” month. Inspired by an article I read in the newspaper, I, personally am going to spend the day seeking heart shapes anywhere and everywhere…in the clouds, the flowers, and in ordinary and not so ordinary objects. As an example, as I just glanced to the right of my monitor, I saw two of my elastic hairbands overlapped in a way that, though I might not have felt this way yesterday, form a heart shape. Honoring the heart and of course love, seems appropriate this last of February. As you travel through your day, I encourage you to try this exercise, too. Love begets love. The more we seek it, the more we shall find it. The more love we find, the more love we will want to share and give away. If you happen to find a unique heart you want to share with a loved one, and you have a camera on your phone, take a picture and spread the love around. On this last day of “heart healthy” February, remember that love makes the world go round…it’s a many splendid thing, it’s all you need and it IS the answer. How many hearts can you find in this picture? The Pill Mill nightmare has a lot of attention in today’s Sun-Sentinel. Governor Scott, enough is enough. All you have to do is enforce a data-base that was already approved and is (was) ready to be put in place in December. His decision to NOT put the data-base in effect makes me wonder who he is connected to? Why not use a tool that is working quite effectively in so many other states? Why does he want people traveling from Kentucky, Tennessee and other points north and west to OUR state to purchase and sell pain pills? Many people who voted for our governor (not me) are now sad and disappointed that he is not representing THEM. To the 3 incredible women who founded STOPPNOW you have my utmost respect for your NON STOP efforts. My heart aches for yours, for your losses and for your frustration, but I see you in the newspaper more and more and I am certain your steadfast efforts WILL be instrumental in forcing change. This week’s arrests were hopefully just the tip of the muderous iceberg. Finally, good news about menopausal hot flashes. Apparently women who experience them at the onset of peri-menopause and menopause are LESS likely to suffer heart attacks or heart disease. Well, that certainly is good news to me who has been playing “covers on, covers off,” while sleeping these past few years. Honestly, the sweating is not too bothersome to me. After all, I sweat for a living! Mitch and I took a ride to The Boys yesterday and even though shopping there on a weekend is total chaos, it was worth it all. We spent $65.oo and got several new plants for the garden, (cilantro, lavender, cucumbers and field greens) and tons of goodies at excellent prices. Cucumbers and lemons, 25 cents a piece! A basket of deliciously ripe, red and sweet strawberries. Gorgeous heads of leaf lettuce, brussel sprouts, avocados, asparagus and celery. Perfect baby eggplants, sweet tangelos and loose portobello mushrooms the size of dinner plates. Seriously. We also bought some fresh bialys for this mornings breakfast and fresh squeezed orange juice to go with. Mitch just toasted his bialy and it smells INSANELY YUMMY. We got a great deal on sweets (chocolate jelly rings that are usually 5 bucks a box at Publix– 2.99 a box at The Boys) for Thursday night dinner/dessert. The boys that come to VFT love those! The store even carrys Tofutti cream cheese which I needed. What a bonus! So last night I halved the brussel sprouts and the baby eggplant, cut up a sweet potato and mixed them all together with some olive oil and fresh herbs from the garden with a sprinkle of salt. I roasted the tray at 425 degrees, mixing them around every 15 minutes or so and roasted them about 45 minutes in total…till they started browning. Along with a huge salad and 2 artichoke halves (grilled with garlic and olive oil??) that we bought pre-made at The Boys it was such a colorful, healthy, low in calories, and most importantly DELICIOUS dinner. I can’t even wait to put together tonight’s fresh veggies…asparagus, portobellos and the rest of the brussel sprouts. But first, the bialy. It is my Sunday morning splurge and I am ready. If you live in South Florida, you have to hit the boys every once in a while. Take a few deep breaths before entering. Be careful of shopping wagons and crazy people!! Then just get in a zone and enjoy the bounty of great deals and gorgeous foods…not just fruits and veggies, but also meats, poultry, fish…a full bakery and a coffee shop and lots of wine,too. It’s definitely not just a store, it’s an experience! It was wonderful to spend time with old friends yesterday. Bloody Marys, salad with tomatoes from the garden, lots of sunshine and good old “group therapy.” Friday “therapy” with those particular friends was a regular thing back when the kids were growing up. Now, with some of us spread apart geographically, and of course work schedules, it isn’t something we can do very often, but when we can, it is priceless and as if we haven’t missed a beat. Teaching class this morning, stocking up on wholesome goodies from the Boys, some attention to the garden, laps in the pool (hopefully) and a home cooked dinner, quality time with Mitch…that’s what’s in store for me, today. 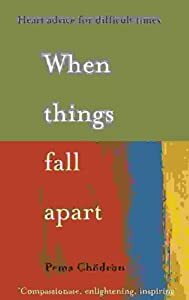 Also looking forward to reading more of When Things Fall Apart. Again, the title suggests dark and depressing, but it’s definitely NOT. Sending warm hugs to those of you that are in a cold weather area of the world. Remember that spring is just around the corner. Even though I reside in a warm weather climate, there is something about spring that is always exciting. Before you know it, we will all be wearing a little less clothes and showing a little more skin. For me, that means its time to shy away from the comfort of foods like pasta and soup and move into more grilled veggies and fruits. I AM READY! As always, I greatly appreciate you stopping in for a little peaceandfitness. Personally, every day, I am committed to practicing peace. I hope you are, too. Posted on February 25, 2011 Categories On the peaceful side1 Comment on What Will You Choose? First things first. BIG WIN against the pill-mills yesterday. I cried hysterically as I watched the busts go down in Miami, Broward and Palm Beach counties, on last night’s news. No two news stories agree upon how many places were closed down, or how many people were arrested, but in any case it was a big sting. Ironically, one of the doctors arrested is the son of our Broward County Medical Examiner. While 7 people a day die of a drug overdose from prescription pain meds, here in Florida, the examiner’s son has been one of the chief suppliers of those prescription drugs. What an irony. Another doctor, Calangelo, was arrested and it is said that he was making $150,000.00 A DAY! 46 cars! This morning I am rejoicing for all the “oxy moms,” (and dad’s and others) who have been peacefully protesting in hopes of this type of outcome, but it does sadden me that it is taking as long as it is. Since our governor doesn’t seem to take the issue seriously enough, I am certainly happy that the DEA is on top of this. They say they have been secretly pill shopping for the past year or so and all the pill-mill operators should assume they HAVE been shopped! If you weren’t busted yesterday, be scared, because your time is coming and your greed game is going to end badly. Not as badly as for the thousands that die each year, or their families, but it will end badly. It’s also a pleasure to see the DEA going after the real drug criminals, though I am so skeptical about who might be tied into BIG PHARMA. While I understand there is a definite need for pain meds for those who really need them, I feel BIG PHARMA has some responsibility in these deaths, too. They have to know what’s going on. Something is SO wrong, but this morning I am optimistic. What an excellent salad base last night. Thanks, Judy, for the gift of romaine from your yard! I added some fresh herbs from my garden and with some fill-ins from the grocery store it was pretty much the main course for dinner. Yes, greatly appreciated and very tasty! Mitch had a slice of pizza and I had some Gardein chicken wings,on the side. For anyone who makes those wings, I always add some earth balance “butter” to tone down the HOT of the wing sauce. I love hot, but this sauce is HOT HOT HOT. That’s your warning. For the first week in many, we did NOT make soup for tonight’s dinner. With Kyle and Nicole here, and family over for lunch Sunday, we skipped the soup project. Tonight I will make a pot of whole wheat pasta, some meatless meatballs, (from Whole Foods freezer section) a big salad with cherry tomatoes and fresh herbs from the garden and probably grill up some veggies, too. Fruit for dessert. A note on nutritional yeast. I put some in a shaker you would use for grated cheese and put it on the table as one would salt, and/or pepper, but usually use it like grated cheese. I buy mine at Whole Foods and they don’t offer many choices. The one I buy so their own brand and it does have B-12 but it is not as nutritional as the one Carole found on line. I am sharing her info since she is the best online researcher I know 🙂 Thanks, Carole. While I have never tried the following recipe (bottom of the page), one day when I am not counting calories, I would like to. Since Kyle added some very cool tools to this site, let’s try this link which popped up on my screen as I typed in the info on nutritional yeast. This will be a good experiment to see how the “related articles” tool works. Let me know that you were able to open the link at the bottom of today’s entry (or not!?!) Thanks. Just a reminder to my SilverSneakers students that this Saturday’s book club event is postponed while Sylna nurses her back, back to good health. Sympathy pains, Sylna! Sympathy pains. Did Marcus give you his backache? Since it is vegan Thursday, if you are looking for interesting recipes or a broad range of info regarding living the “kind” life, don’t forget to stop in to Alicia Silverstone’s site at www.thekindlife.com or find her link on my links page. Her site is chock full of everything kind. Thanks, Alicia for being such a great inspiration. Remember, also, that all ads on the site are safe and secure as they are brought to us by our good friends at Google. They are generally quite relevant to the topic of the day and can offer further info on subjects that I just touch upon. Happy Thursday. Be kind. Eat kindly. Pass it on. When I wake up to morning news that says “exercise is the magic bullet for maintaining youth,” it brings a tear, as Mitch says, to my heart. It’s not yet 7 am and already one news story was about how mice on treadmill routines regained their youth, and another about dogs on underwater treadmills (just their head’s above water) kept from getting arthritis, hence keeping them much more youthful. I recently mentioned that I am certain my bigredguy, Blaze, remains as youthful as his puppy days from his very, very daily walks. While I realize it’s very hard to squeeze exercise into busy days and weeks, it has become more and more obvious that it IS the magic bullet for maintaining or restoring youth and health. Without our health we are nothing, so that better health results in happiness. And speaking of better health and happiness, Biggest Losers are always winners. Last night’s episode found the teams competing in a challenge with big, heavy balls that needed to be punched down a field and into the goal. 8 of them. Red team made it look like child’s play, while black team struggled and never quite got the hang of it. Again, a clear case of a stacked team with Olympic winner Rulon playing on the red team with his buddy Justin, several other men and just 2 women, while the black team’s, mostly “girls,” found the balls heavy and hard to manipulate with the boxing gloves on. Believe me, I am not saying men are better athletes than women, but they ARE stronger. That’s just science and reality. So, of course the red team wins and the prize is a 3 pound advantage at the weigh in. There is some talk amongst the 3 parents on the black team. Marci (I love her!) wants to make sure NONE of the “kids” go home. Deni agrees and I never really understand Jesse. At the weigh in, it’s quite clear that the 3 parents were all on the same page, each gaining weight. Marci was up a pound, Jesse 2 and Deni 8!!!! How much water did she drink before the weigh in??? Jen also gained 2 pounds, which I didn’t understand but sometimes woman fluctuate A LOT. Thankfully, the parents did what they did, not only to save their own children, but every one’s children. Since there was a red and a yellow line last night, Deni’s 8 pound weight gain puts her beneath the red line and black team is left to eliminate one more. They all vote for Jesse and black team is down 2! We see Jesse looking great at 227 pounds and Deni at 170. Everyone seems to do well at home which always makes me believe that BL gives them some excellent support once eliminated. Biggest Losers are always winners. Regained youth and health…and happiness. All of them. Brings a tear to my heart! Yesterday I decided it was warm enough to try to hit the pool and after almost 3 months of not being in it, it felt unbelievably awesome. I did about 20 laps and could have stayed in forever, but I knew I had to go back to work so I had to save some energy, even though swimming really is so effortless and just being in the water, my muscles and joints were screaming “THANK YOU, THANK YOU.” If you have access to a pool, weather permitting, I can’t express enough how much I think you should try swimming this year. How cool is it when you get to work and someone brings you homegrown lettuce from their garden. Thanks, Judy A. It WILL be the base of tonight’s salad. I can’t wait to reciprocate and spread wealth from the Zipp gardens. Yesterday I saw the first of the strawberry plants flower and the butter-crunch lettuce seems to grow while I look at it! A decision was made this past weekend to take my work schedule down from the site. If you are interested in taking a class or interested in personal training, please contact me directly through this site. Have an awesome day and remember, the more you move, the younger, healthier and happier you will be…not preaching, just sharing morning news! Lots more thoughts about energy. Forceful exertion; the amount of work that can be performed by a force; any source of usable power. Energy. It can be positive, it can be negative, it can be dynamic, vigorous, productive and non-productive. We can absorb it, emit it, make it vigorous, conserve it, use it up and even waste it. Lots and lots of wasted energy. Mentally, emotionally, spiritually and physically. To me, worrying is a great example of wasted energy. Pushing a wall (that will never move) is obviously another example of wasted energy. Huh? I often use that “pushing a wall” as an example of how we may be working really hard at something but it doesn’t necessarily mean we are getting a good work. You can put on your sneakers, head to the gym and start pushing a wall. You will probably sweat and use up a lot of energy, but that wall is never going to move. You may even feel the work in your upper body muscles the next day, but certainly that energy could have been used much more productively. Sort of how I feel about those “toning” shoes. Every company makes them now. Sketchers is even being sued over someone claiming to have gotten pelvic fractures from walking in them. I am not so sure how that can happen, but I have been pretty sure since they first arrived on the market, that they are a case of “if something is too good to be true, it probably isn’t.” Sure, they change the way you distribute your weight, engaging different muscles than we are used to using to walk. Of course, the wearer would feel those new muscles working. Doesn’t mean they will make you fit, just means you will engage different (not necessarily better or more) muscle. In one study done at the University of Wisconsin, researchers tested 3 brands of toning shoes and after a dozen 5 minute spins on the treadmill, compared differences in muscle activity in the calves, quads, hamstrings, buttocks, back and abs and they found, well…they found, “squat.” I agree with the good doctors, Oz and Roizen, when they suggest saving the up to $200 for a pair of toning sneakers and instead do squats, lunges and one-legged exercises to increase core strength and improve balance. On a completely different note, what great energy on the part of the mom’s who make up STOPP–the “oxy moms,” fighting against the horrific situation regarding Florida’s pill-mills. There grass-roots efforts (energy) have put them on the front page of the main section of today’s Sun-Sentinel. My guess is, as they fight for their children, energy will abound until their job is done. That’s energy well spent. Speaking of children, it was all GREAT ENERGY being with ours this past weekend. 9 of us sitting around that dining room table on Sunday, made for the type of energy that nourishes and fills my soul. As you go through your day, I hope you will give some thought to how you use YOUR energy. Make it positive and productive. If you are local I hope to share some energy with you tonight at TFC. My mind seems to be wrapped around the word ENERGY. Good energy, bad energy, negative energy, positive energy, productive and non-productive energy. Last week I watched an episode of Oprah that dealt with the young boy, Zach, a child born with unusual strength, violent rage and hypersensitivity. If you watched the show, you understand why I am still thinking about it. If you didn’t, suffice to say that this boy’s sensitivity is keen in terms of GOOD energy as it is bad. He explains to Oprah how he senses negative energy and this turns him from the good, loving boy he believes he is, into a violent, dangerous, raging terror. I won’t go into all the details, as again, if you saw it, you know. If you didn’t and you have a few minutes, a simple google of “Zach on the Oprah show,” should bring up videos and articles. Zach, took scissors to a kindergarten classmate and at 7 (I believe) tried to kill his mother with a kitchen knife. He claims to hear voices OUTSIDE his head when he is surrounded by negative energy. Oprah asks him how he has learned to deal with these voices and he simply, calmly and VERY wisely says that he surrounds himself with white light and repeats affirmations like “I am calm, I am peaceful, I am awesome, I am love, and I am light.” He feels that he needs to tell his story because too many people in the world suffer as he does, absorbing negative energy and that’s what’s wrong with the world. I think he might be right on the money! Oprah tells Zach that she too uses the white light to surround herself and meditates upon it every morning before she leaves the house. It serves as her “shield,” against the negative energy in the world. So now I can’t stop thinking about Zach. How in western medicine we call this type of behavior mental illness. Writers such as Steven King has created brilliant stories based on characters just like this, The Shining, being a great example. I am thinking there is something in between the fantasy world of science fiction and the concrete world of western medicine. My thoughts simply come back to ENERGY. Perhaps, that is why my quote yesterday was about inner light. I believe we are highly influenced by others energy and more importantly we have the ability to high influence others, by our own. I am pretty sure I have a lot more to say about energy, how we absorb it, what we emit and how we use energy, too…like the energy we spend in the gym. So this blog is definitely a “to be continued.” For now, I think we should all give some consideration to surrounding ourselves with guarding white light on the outside and a shining, bright light on the inside. Remember that the energy you give off, will be absorbed by others. I am still POSITIVE this is why I had the headache from hell that landed me in the emergency ward August of 2001. On the afternoon of September 11, when my brother called to tell me they were looking for one Mohammed Atta who lived just around the corner from me…it all made sense to me. I’ll be setting aside a minute or two to mediate on some white light before leaving the house. Just as importantly, I will work hard to give off positive energy wherever I go. We may have more impact on others, and the world at large, than we give ourselves credit for! Wishing you a very bright day filled with lots of light, love, peaceandfitness and great energy! I am thankful to Zach and his mom, Laurie for having the courage to share their story. It is through others that we learn about ourselves. It seems that all I hear and read about lately, is the power of ORANGE foods. While we have talked about sweet potatoes, other orange foods like pumpkin, carrots and …even oranges, are all super foods for us. Not only are they great for our insides, but also great for our outsides. In fact, it is suggested that eating orange foods can help give our skin a glow much like we would get from the sun. Internally, the alpha-carotene rich foods, fight against cells that lead to chronic diseases like cancer and heart disease. Not that I want to obsess about the sweet potato, but the Center for Science in the Public Interest, considers it THE most nutrient-dense food. Along with the apha-carotene it is rich in carotenoid (that sounds orange, too!) and potassium and eating about a cup of day is enough to dramatically lower our risks against many cancers!! The mango comes in a close second. While our mango tree (planted in my brother’s memory) does have some flowers, it’s our next door neighbors mango flowers I can smell from here. Reminds me spring is just around the corner. Once again, filling your plate and belly with a rainbow of foods, is the best way to insure you are getting a rainbow of nutrients and anti-oxidants. Fruits and veggies. Preventative medicine that’s easy to swallow! Orange you glad you stopped in? How about some orange juice before you get your day started? Have a great Saturday. Posted on February 19, 2011 Categories Food, health and happiness5 Comments on Orange You Glad?